Between my full-time job, fellowship, my at-home business, and my cats, I don’t always have time to prepare a fancy dinner. Forget just a fancy dinner – sometimes I don’t time to prepare any dinner. I’ve eaten far too many frozen pizzas and bowls of cereal for dinner than I’d care to admit. Not only is it kind of sad, but it also isn’t very healthy. That was one of the reasons I’d started going to meal-assembly stores – a way to have all of my meals prepared ahead of time so I could eat healthy meals with minimal preparation. Unfortunately, my local meal assembly store closed its doors and the next closest one is about over 30 minutes away making it a little inconvenient to visit on a regular basis. Fortunately, a solution to my dinner dilemma arrived at my door in the form of Holly Clegg’s trim&TERRIFIC Freezer Friendly Meals. The author of seven different cookbooks, Holly Clegg lends her recipes and her expertise to help make harried women of today by providing quick, healthy, and easy meals we can make in advance. I can’t call this book just a cookbook because it’s more than that. It has recipes that you can serve right away, but the twist is that the meals can also be frozen and served later. It’s more of a cook/prep book. 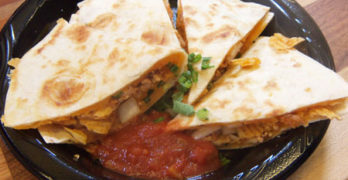 trim&TERRIFIC Freezer Friendly Meals is broken up into several sections. 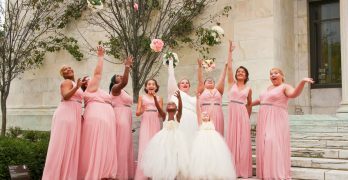 First are the basic introduction and freezing facts, which includes guidelines for what you can and can’t freeze, how to freeze it, and how long you can freeze it. Then, it gets into the real “meat.” The recipes are broken up into 9 categories, starting with appetizers, then moving on to Muffins, Breads, and Brunch; Chilies, Stews, and Soups; Sides and More; Poultry; Meat; Seafood; Desserts; and finally Pies, Cookies, and Cakes. All of these sections total for over 200 recipes that are prep-friendly and freezer ready. There are also some beautifully taken food photos to help you see how some of the recipes look after being prepared and cooked. As you go through the recipes, you’ll notice that each recipe has the nutritional information per serving and the number of servings the recipe makes. There are instructions for preparing the recipe for dinner that night or for when preparing ait after freezing. Finally, there is a little section about freezing with recommendations on the container and how long you can keep the dinner frozen. For testing purposes I cooked up two of the recipes from trim&TERRIFIC Freezer Friendly Meals. As I was reading the ingredients for this recipe, I wasn’t exactly sure how this would turn out. It required 5 ingredients, plus the pepper. I wondered how well the marinade would be and how much the pork would retain the flavor of the marinade. Meal preparation was very easy taking all of about 3 minutes to measure out and dump the ingredients into the bag. 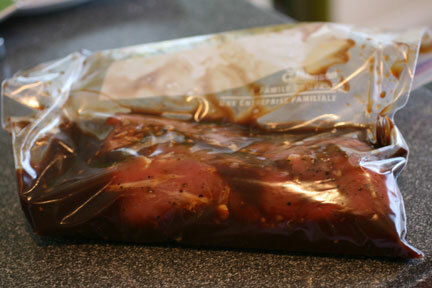 Here’s the tenderloin marinating in a Ziploc bag. I have a duplicate bag in the freezer that I can cook up within 2 months. Now the pork has just come out of the oven. Notice the nice brown coloring on the outside of the meat. And finally, here is the final picture of the perfectly tender pork tenderloin with my side dishes. After taking a bite, all I could say was, “Wow.” Each bite of pork oozed with what I thought was a combination of barbeque and Asian flavors. 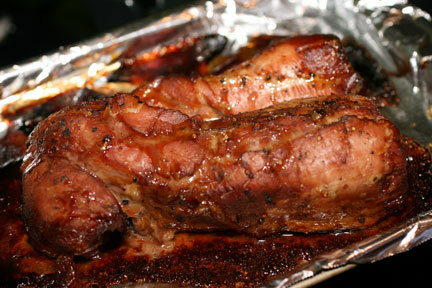 The pork came out tender and cooked just right following the recipe instructions. 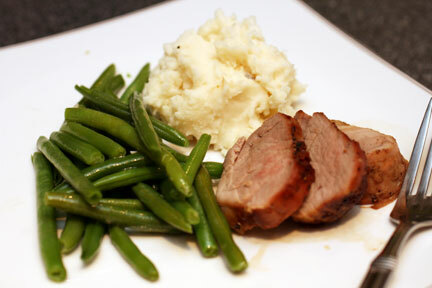 I served it with steamed green beans, stir-fried in garlic and garlic mashed potatoes. The entire meal was delicious. 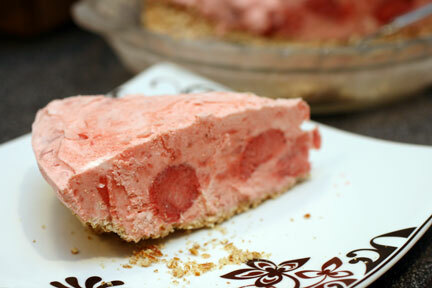 I was really excited when I stumbled across the recipe for Strawberry Margarita Pie. I’d actually made a dish of the same name (but different ingredients) from a store and fell in love with it. Sadly, the store didn’t let me copy the recipe, so I was very happy to discover a recipe in this book. I had a couple of minor stumbling blocks with this recipe. 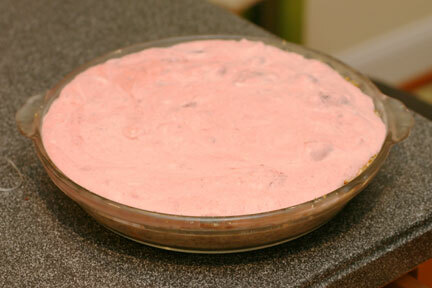 The first was that the store didn’t care strawberry pie filling, so I had to make my own (and it came out darn good if I do say so myself.) The second was that my rolling pin is gone and I had to use a bottle to crush the pretzels. Let me tell you – crushing pretzels with a bottle is an arm workout! Doesn’t that look delicious? It totally was. The blend of the sweetness of the strawberries and Cool Whip, combined with the saltiness of the pretzel crust were amazing. I forgot to add fresh strawberries as a garnish, but neither I nor my fellow testers missed that. A few of us weren’t happy with just one slice and needed to get seconds. Both of the recipes from trim&TERRIFIC Freezer Friendly Meals were easy to follow and resulted in great tasting dishes. I love the convenience and peace of mind I have by knowing that in a pinch, I still have an extra Pepper-Glazed Pork Tenderloin in the freezer which really demonstrates the value of preparing meals ahead of time. If you’d like a sneak peek at some recipes from trim&TERRIFIC Freezer Friendly Meals or for more information about Holly Clegg you can visit her website at www.hollyclegg.com. You can also visit her blog, The Healthy Cooking Blog for additional recipes and tips. You can purchase your own copy of trim&TERRIFIC Freezer Friendly Meals from Amazon or you can win a copy in the WCatDD Freezer Friendly Meals Giveaway! 1 winner will receive their very own copy of Holly Clegg’s trim&TERRIFIC Freezer Friendly Meals. Disclaimer: This post consists of my (and/or fellow tester) opinions only. Your experiences may be different. No compensation was given for this review/giveaway. I did receive a free copy of trim&TERRIFIC Freezer Friendly Meals from the manufacturer or their representing PR agency to use and test for the purposes of this review. This did not affect the outcome of this review.